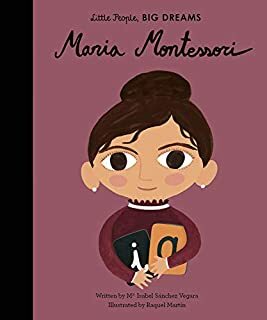 As the mother of a four-year-old who attends a Montessori school, I was excited to see this accessible biography about Maria Montessori! Dr. Montessori developed a pedagogical approach that empowered students to take control of their environments and their behaviors while simultaneously foregrounding the importance of community. This short biography, written by Isabel Sanchez Vegara and illustrated by Raquel Martin, introduces students to the work of this remarkable woman from early experiences that prompted her to pursue teaching to her activist work that provide children with developmental disabilities agency and improved life chances. This is a wonderful book, great for parents and educators interested in introducing young children to strong and impactful women! This book is one of dozens available as part of Frances Lincoln Children’s Books’ Little People, BIG DREAMS series. Check out their titles and decide which biographies are the best fir for your personal library!